Abstract:This paper discusses the development of a software simulator to predict the optimum drying conditions of a bed of cocoa beans in a convective dryer. To achieve this, a suitable mathematical drying model based on the Luikov’s model of heat and mass transfer in a capillary porous medium, were derived, to define the drying behavior of the bed. A heat source term was introduce in the energy equation due to the enzymatic browning reaction in cocoa beans during drying. The result-ing coupled heat and mass transfer equations were discretized using the finite difference method based on the notation of control volume. An algorithm was created to implement this solution into a computer program using a complex of Rapid a p-plication development tools which include Visual Studio, CodeFluent Entities and MATLAB. 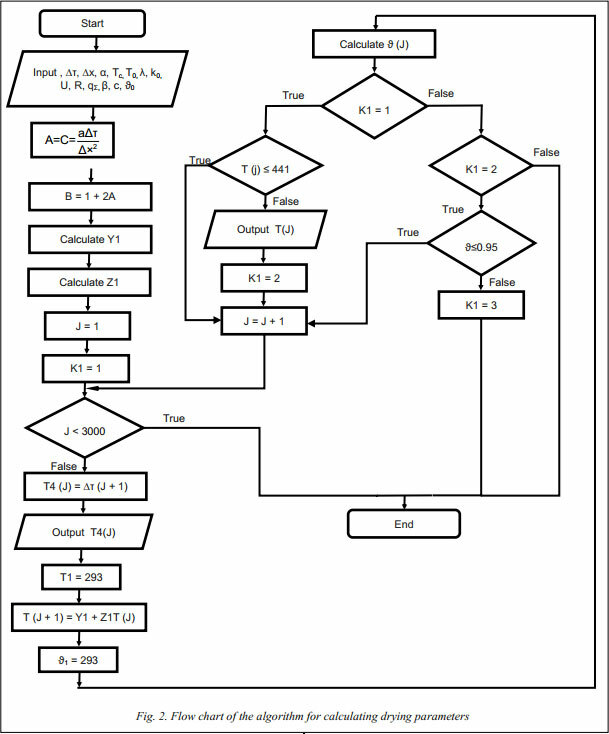 The algorithm was implemen t-ed in MATLAB 7.12 and was later exported through COM into Visual Basic .NET code for further development of the simu-lator in Visual Studio 2010. 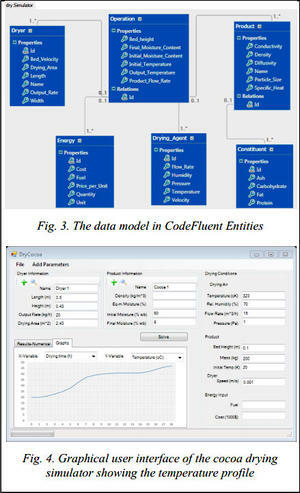 A logical model of the database was developed using the Graphical Modeler in CodeFluent Entities and later exported into a physical MS SQL Server database. The simulator will serve as a powerful decision making tool, that will be useful for engineers or operators to develop optimum drying conditions to improve the quality of cocoa beans and the final cocoa products. Аннотация:В статье рассматривается процесс разработки программного обеспечения для определения оптимальных условий сушки слоя какао-бобов в конвективной сушилке. Для достижения данной цели на основе модели В. Лыкова (тепло- и массоперенос в капиллярной пористой среде) разработана математическая модель определения свойств слоя какао-бобов во время их термообработки. В ходе исследования был разработан алгоритм решения системы уравнений тепломассопереноса. Полученный алгоритм реализован при помощи инструментальных средств быстрой разработки приложений RapidApplicationDevelopmentTools, включая VisualBasic. NET, CodeFluent Entities и MATLAB 7.12. Симулятор будет служить мощным инструментом принятия решений, полезным для инженеров и операторов при разработке оптимальных условий сушки, необходимых для улучшения качества какао-бобов и конечных какао-продуктов. Drying is a separation operation which converts a solid, semi-solid or liquid feedstock into a solid product by evaporation of the liquid into a vapor phase via heat application [1, 2]. Product moisture removal prevents the growth and reproduction of decay-causing microorganisms and minimizes many of the moisture-mediated deterioration reactions. The moisture loss from the product brings about a substantial reduction in weight and volume and eases their handling. Cocoa drying is required to develop a complete chocolate flavor that appeared during the fermentation processes and to further reduce the moisture content from about 60 % to about 8 % [3–5]. Drying temperatures for cocoa beans range around 30–60 oC depending on the process, equipment and type of beans [3–6]. This is because such temperatures allow for the most conducive drying rate which is of crucial importance for the final quality of the beans. Very high drying rates tend to produce acidic beans (as they retain acids such as acetic acid) which is deleterious to the flavour. Too slow a drying rates on the other hand will result in beans with low acidity, poorer colour and high presence of moulds [3, 5, 7]. Determining and predicting the drying characteristics of cocoa beans has been the subject of numerous research works [3, 4, 8, 9]. Mathematical modeling and simulation are important tools in the development, design and analysis of cocoa drying systems. Although a lot of work has been done to model the temperature, moisture distributions inside cocoa beans during drying, little scientific literature on the development of user-friendly simulation software for drying of cocoa beans is available. This paper discusses the development of a software to predict optimum drying conditions for a bed of cocoa beans. To achieve this, a suitable drying model (coupled heat and mass transfer equations) has been specified in defining drying behavior. The developed software predicts the optimum drying conditions using these equations. Even though empirical equations provide very accurate results for each specific experiment, they are not valid for other conditions and as such simulation models are therefore ideal for describing the drying process . With simulation an appropriate software is used to predict the real performance of a pro- cess . The simulator software developed in this work is heavily modularized (as shown on figure 1) with a user friendly graphical user interface. Such a software will help dryer manufacturers in decision support in terms of exploring new designs for cocoa dryers (computer prototyping), and will aid processing industry engineers to better exploit the capacities of existing cocoa dryers and to forecast costs and will help government agencies to better educate farmers on better drying techniques. The architecture of the simulator is illustrated on figure 1. 1. Selection and designing a mathematical model to describe the drying process. 2. Solving the partial differential equations using the appropriate numerical method. 3. Implementing the solution in a computer program. 4. Developing a data model to store the output values. 5. Developing a user-friendly user interface. A typical drying system is made up of the following components: drying equipment (dryer); a drying agent (air, steam, etc); and a drying material (cocoa). In order to effectively model the drying process, the parameters of all these components need to be considered. The dryer component is characterized by its size (length L and height H) of the drying chamber; the product flow rate (speed of the conveyer belt S) and the area of the belt covered by the product A; energy E needed to heat the air and move the conveyer belt. The product on the other hand has an initial U0, final Uf and equilibrium Ue moisture contents; initial T0, maximum Tm and exit Tf temperatures; bulk flow rate and other drying properties such as specific heat, water activity, diffusivity, heat conductance etc. The drying air has a flow rate, chamber air temperature Tc and exit temperature Te and relative humidity . In order to fully model the drying process, all or some the above mentioned component properties must be considered and modeled. As a result, engineering problems in the area of drying generally involve the calculation or prediction of one or some of these parameters using other parameters as input as shown in table 1 (Adopted from ). Using these parameters and the appropriate laws of physics, we derived a mathematical model to be used in developing the simulator. Modeling is the process of translating the physical laws of a process (such as drying) into mathematical equations to analyze or design the process . In drying process modeling these mathematical equations are derived from material and energy balances, thermodynamic equilibrium relationships, transport phenomena, geometry, equipment characteristics, etc. Mathematical models are used in drying process modelling to predict drying parameters such as drying time, output product temperature and air humidity . Drying processes can be completely described using an appropriate mathematical drying model which is made up of differential equations of heat and mass transfer in the interior of the product and at its interphase with the drying agent. In this paper a mathematical model based on the Luikov’s model [9, 11–13] was derived and applied in the simulator. The third term on the right hand side of the equation of energy is the heat source term due to the enzymatic browning reaction in cocoa beans during drying. Cocoa enzymatic browning reaction properties and parameters used in this work are taken from . The above equations (1)–(11) together with the thermodynamic properties of cocoa beans taken from the works of [14, 15] will be solved to achieve the complete mathematical model to be used in the simulator. The above system of nonlinear partial differential equations (eq. (1)–(11)) were discretized using the finite difference method based on the notation of control volume. 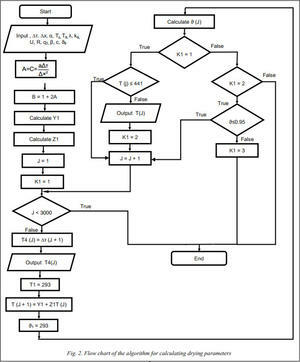 An algorithm as shown on figure 2 was created to implement this solution in MatLab and was used for the development of the simulator. MATLAB 7.12 (R2011a) version was used including tools such as the Partial Differential Equation (PDE) toolbox, Graphical Library and Math Library. MATLAB Functions (in m files) were created to perform the finite difference computation to solve the governing equations. After implementing the above algorithm in MatLab the code was exported to Visual basic .NET through a COM interface for further development of the cocoa drying simulator in Microsoft Visual Studio 2010. Input as well as calculated parameters for the simulator are stored in a relational SQL Server database for future referencing. To create the database a data model was created in CodeFluent Entities. CodeFluent Entities is a Rapid Application Development (RAD) tool developed by SoftFluent which is integrated into Visual Studio (versions 2008 and above). It provides code generators called producers for SQL Server, the Oracle Database and the SQL Azure to translate user models into a complete database as well as producers for .NET languages such as Visual Basic, C# and ASP. The code generation process is model-first and continuous. Thus it uses user declarative model as shown in figure 3 to generate a meta-model from which codes are generated using the code generators . The data model on figure 3 was then exported into a physical SQL database model. As mentioned earlier in table 1, engineering problems in drying come in different forms, but the simulator developed in this work only emphases on predicting drying process parameters, such as temperature and moisture profiles of the bed of cocoa beans as well as the drying duration. In this case the user will be required to input into user interface: the parameters of the dryer, drying air and product for the processing and display of the process parameters on the user interface as shown on figure 4. As shown on figure 4, the simulator is an advanced Windows application which incorporates the most powerful features of MATLAB, CodeFluent Entities and Visual Basic .NET platforms to offer a very intuitive user experience. It uses menus, tool bars, buttons, grids, figure viewer, etc, to provide a simpler and more intuitive interface for data input and allows the user to view results in different ways (in tabular or graph form). With a little upgrade it can be used to model the drying of any other type of grain. 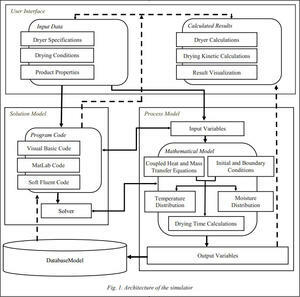 A windows based simulator was developed using a complex of rapid application development tools which include Visual Basic .NET, CodeFluent Entities and MATLAB 7.12 to simulate the drying process of a bed of cocoa beans in a convective dryer. It is based on a mathematical model derived from the Luikov’s model of heat and mass transfer in a capillary porous medium. It will enable users to calculate drying conditions such as temperature, moisture distribution in a bed of cocoa beans as well as drying time. The simulator will serve as a powerful decision making tool that will be useful for engineers or operators to develop optimum drying conditions to improve the quality of cocoa beans and the final cocoa products. By using this tool engineers can calculate and assess the possibilities of different drying conditions to arrive at the most optimal combination of drying parameters before their real application. This will reduce cost and save them a lot of time. 1. Mujumdar A.S. (Ed.) ME5202 Industrial transfer process­es. National University of Singapore, 2012. 2. Mujumdar A.S. (Ed.) Handbook of industrial drying. 2nd ed., NY, Marcel Dekker Publ., 1995, pp. 20–31. 3. Hii C.L. 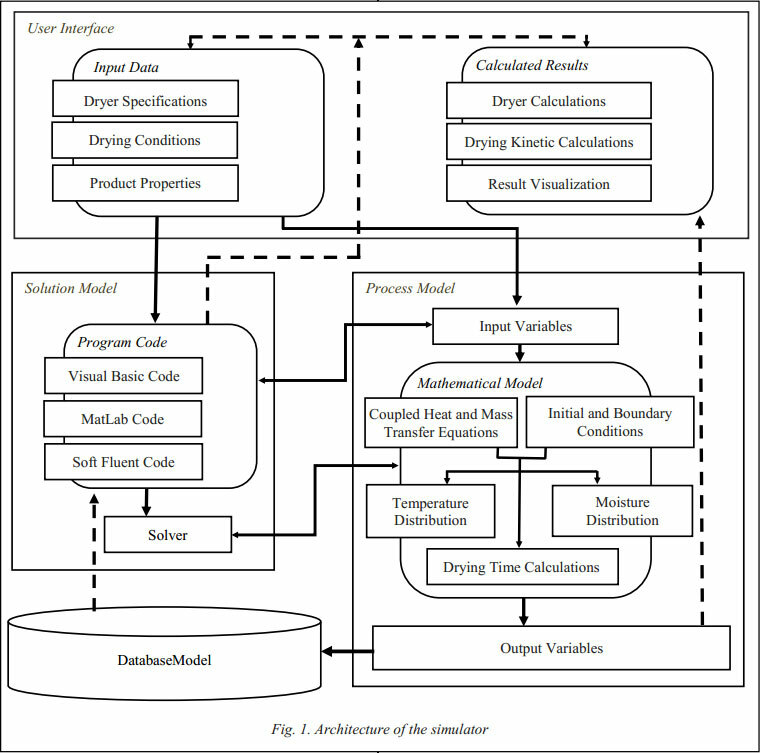 Modeling of the cocoa drying kinetics modeling of the cocoa drying kinetics. Malaysian Cocoa Journ., 2008, pp. 51–59. 4. Hii C.L., Law C.L., Cloke M. Modeling of thin layer drying kinetics of cocoa beans during artificial and natural drying. Journ. of Engineering Science & Technology. 2008, vol. 3, no. 1, pp. 1–10. 5. Afoakwa E.O. Chocolate Science and technology. Hobo­ken. Wiley-Blackwell Publ., 2010, 296 p.
6. De Zaan Cocoa and Chocolate Manual. 40th anniversary ed., ADM Cocoa Publ., 2009, 170 p.
7. Rolando S., Renzo A., Stina F. Optimizing chocolate pro­duction through traceability: a review of the influence of farming practices on cocoa bean quality. Food Control. 2013, no. 29, pp. 167–187. 8. Nganhou J. Heat and mass transfer through a thick bed of cocoa beans during drying. 2004, vol. 40, pp. 727–735. 9. Nikel S.A. Povyshenie effektivnosti protsessa teplovoy ob­rabotki kakao – bobov i arakhisa [Efficiency improvement for the heat treatment process of cocoa beans and peanut]. Voronezh, 2002. 10. Domingos S.M.V., Queiroz D.M., Da Silva L.C., De Oliveira G.H.H., Fábio L.S. LINSEC – The software for modeling and simulation of grain drying systems. Journ. of Agronomic Scien­ce. 2012, vol. 43, no. 4, pp. 664–673. 11. Lykov A.V., Mikhaylov Yu.A. Teoriya teplo- i massopere­nosa [Theory of energy and mass transfer]. Moscow-St. Petersburg, Gosenergoizdat Publ., 1963, 536 p.
12. Lykov A.V. Teplomassoobmen [Energy and mass trans­fer]. 2nd ed., Moscow, Energiya Publ., 1978, vol. 2, 242 p.
13. Lykov A.V. Teoriya sushki [Drying Theory]. 2 ed., Mos­cow, Energiya Publ., 1968, 471 p.
14. Kyi T.M., Wan R.W.D., Mohammad A.B., Samsudin M.W., Kadhum A.A.H., Talib M.Z.M. The kinetics of polyphenol degradation during the drying of Malaysian cocoa beans. Int. Journ. of Food Science and Technology. 2005, vol. 40, pp. 323–331. 15. García-Alamilla P., Salgado-Cervantes M.A., Barel A., Berthomieu G., Rodríguez-Jímenes G.C., García-Alvarado M.A. Moisture, acidity and temperature evolution during cacao drying. Journ.of food engineering, 2007, vol. 79, no. 4, pp. 1159–1165. 16. De Oliveira G.H.H., Corrêa P.C., de Souza Santos E., Treto P.C., Diniz M.D.M.S. Evaluation of thermodynamic proper­ties using GAB model to describe the desorption process of cocoa beans. Int. Journ. of Food Science and Technology. 2011, vol. 40, no. 10, pp. 2077–2084. 17. CodeFluent Entities documentation. 2012. Available at: http://www.softfluent.com/documentation/ (accessed April 18, 2014). 18. Gong Z.-X., Mujumdar A.S. Software for design and ana­lysis of drying systems. Drying Technology – An Int. Journ. 2008, pp. 884–894. 19. Mujumdar A.S., Wu Z.H. Thermal drying technologies: New Developments and Future R&D Potential. Proc. of the 5th Asia-Pacific Drying Conf. World Scientific Publ. Co. Pte. Ltd., Hong Kong, 2007. 20. Mujumdar A.S. R&D Needs, Challenges and Opportuni­ties For Innovation In Drying Technology. 2010 Available at: http://serve.me.nus.edu.sg/arun/E_books.htm (accessed April 18, 2014). 1. Mujumdar A.S. (Ed.) ME5202 Industrial transfer processes. National University of Singapore, 2012. 4. Hii C.L., Law C.L., Cloke M. Modeling of thin layer drying kinetics of cocoa beans during artificial and natural drying. Journ. of Engineering Science & Technology, 2008, vol. 3, no. 1, pp. 1–10. 5. Afoakwa E.O. Chocolate Science and technology. Hoboken. Wiley-Blackwell Publ., 2010, 296 p.
7. Rolando S., Renzo A., Stina F. Optimizing chocolate pro­duction through traceability: a review of the influence of farming practices on cocoa bean quality. Food Control, 2013, no. 29, pp. 167–187. 9. Никель С.А. Повышение эффективности процесса тепловой обработки какао-бобов и арахиса: дисс. канд. тех. наук. Воронеж: Изд-во Воронеж. гос. технол. акад., 2004. 181 с. 10. Domingos S.M.V., Queiroz D.M., Da Silva L.C., De Oliveira G.H.H., Fábio L.S. LINSEC – The software for modeling and simulation of grain drying systems. Journ. of Agronomic Science. 2012, vol. 43, no. 4, pp. 664–673. 11. Лыков А.В., Михайлов Ю.А. Теория тепло- и массо­переноса. М.–Л. : Госэнергоиздат, 1963. 536 c.
12. Лыков А.В. Тепломассообмен: справочник. М.: Энер­гия, 1978. 242 с. 13. Лыков А.В. Теория сушки. М.: Энергия, 1968. 471 с. 14. Kyi T.M., Wan R.W.D., Mohammad A.B., Samsudin M.W., Kadhum A.A.H., Talib M.Z.M. The kinetics of polyphenol degradation during the drying of Malaysian cocoa beans. Int. Journ. of Food Science and Technology, 2005, vol. 40, pp. 323–331. 16. De Oliveira G.H.H., Corrêa P.C., de Souza Santos E., Treto P.C., Diniz M.D.M.S. Evaluation of thermodynamic properties using GAB model to describe the desorption process of cocoa beans. Int. Journ. of Food Science and Technology, 2011, vol. 40, no. 10, pp. 2077–2084. 17. CodeFluent Entities documentation. 2012. URL: http:// www.softfluent.com/documentation/ (дата обращения: 18.04.2014). 18. Gong Z.-X., Mujumdar A.S. Software for design and analysis of drying systems. Drying Technology – An Int. Journ., 2008, pp. 884–894. 20. Mujumdar A.S. R&D Needs, Challenges and Opportuni­ties For Innovation In Drying Technology. 2010. URL: http://ser- ve.me.nus.edu.sg/arun/E_books.htm (дата обращения: 18.04.2014).